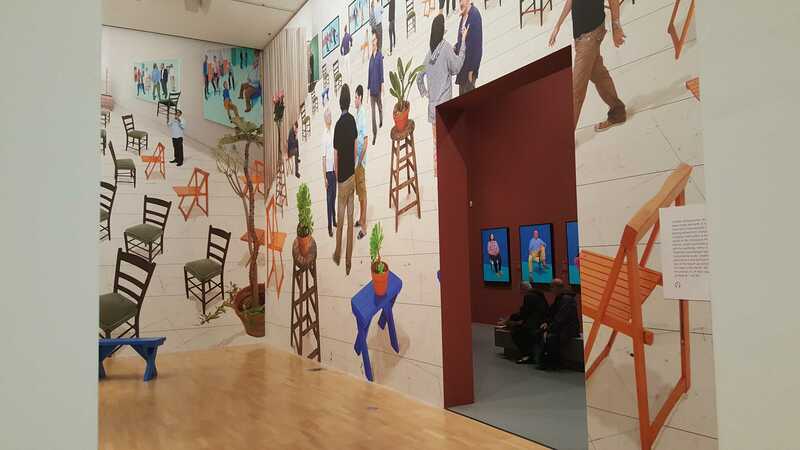 39 David Hockney Current Exhibition at National Gallery Victoria, Melbourne, Australia – Nov 2016. 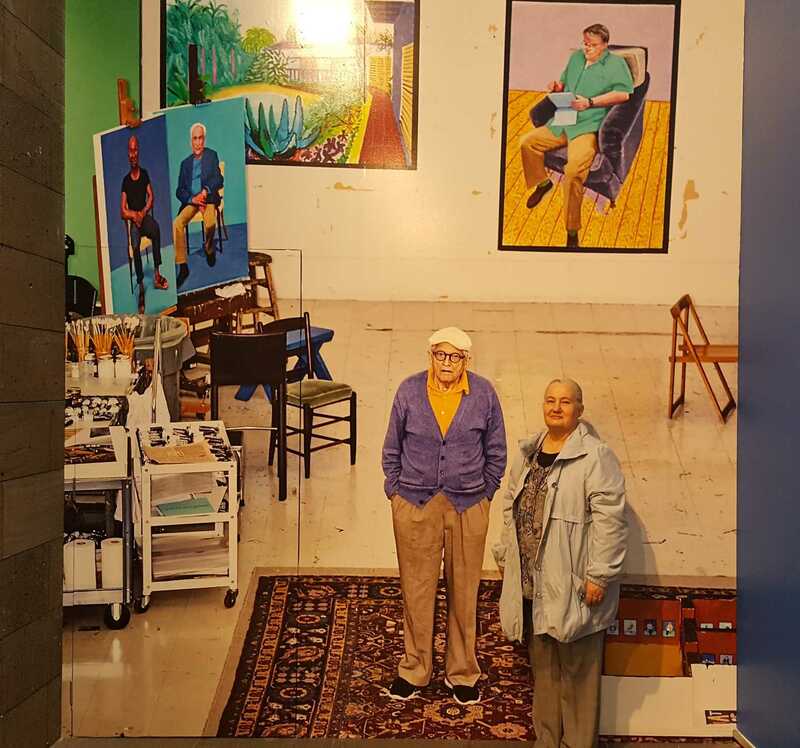 The gallery had provided a huge life-size photo image applied to a wall, featuring David Hockney standing in his studio. 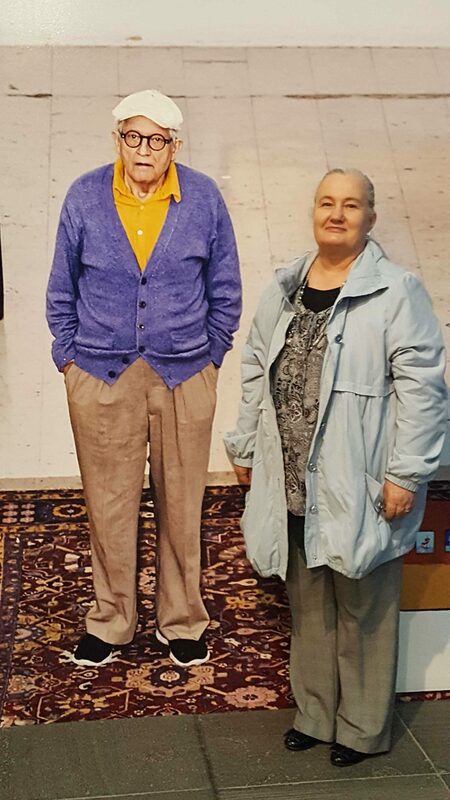 Visitors of the gallery were then able to stand beside the image of David Hockney and have their photo taken. 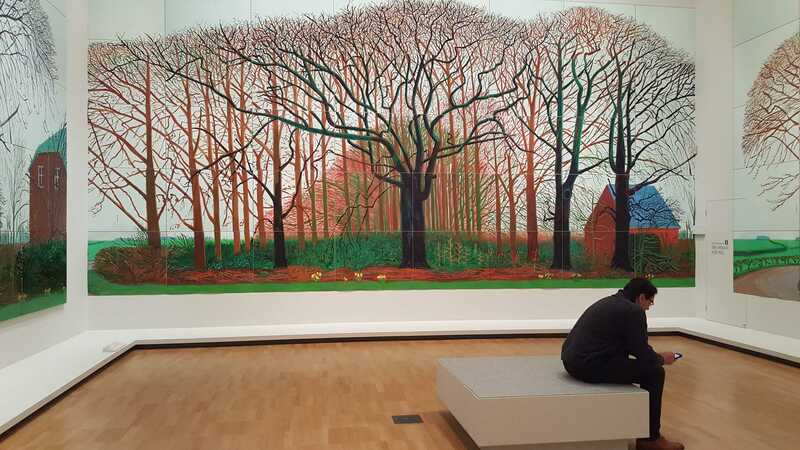 The security guard at the gallery kindly offered to take a photo of me with David Hockney’s image which was very nice of him. 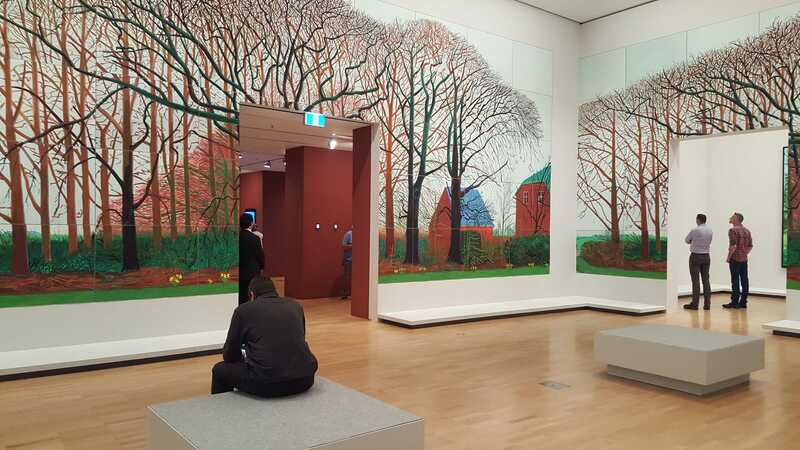 Photographed by Security Guard at the National Gallery of Victoria. 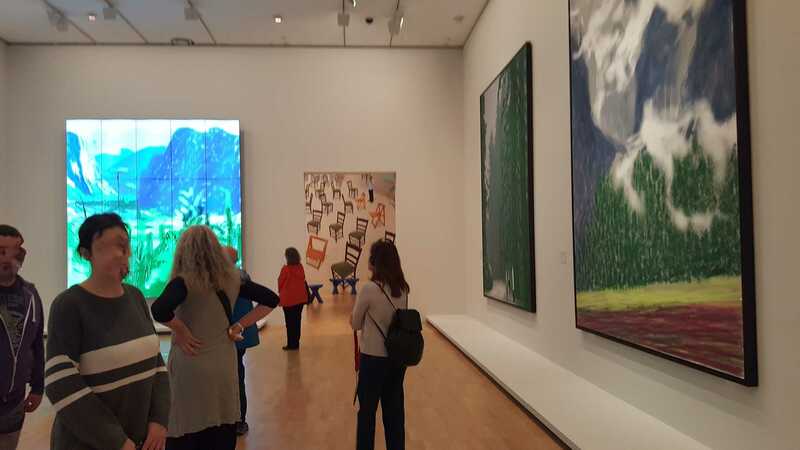 For our very last CAE ‘Produce Paintings & Drawings’ class, we were taken to the National Gallery of Victoria, Melbourne, Australia to see David Hockney’s latest solo exhibition titled ‘CURRENT’. 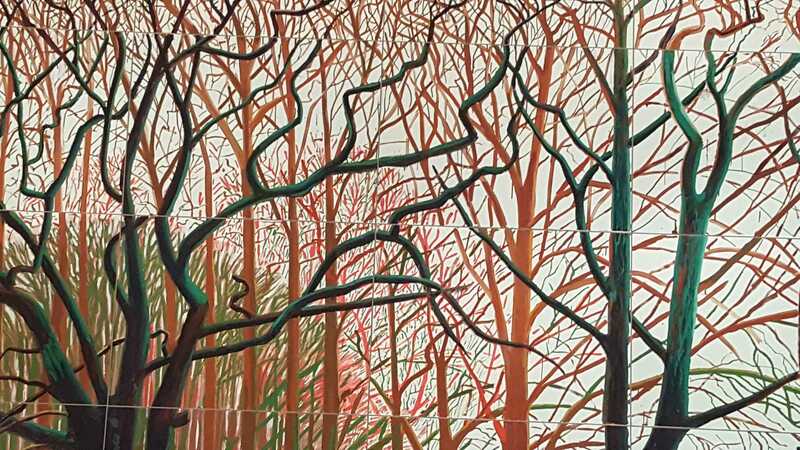 He is arguably Britain’s greatest living artist and in his seventy-ninth year! 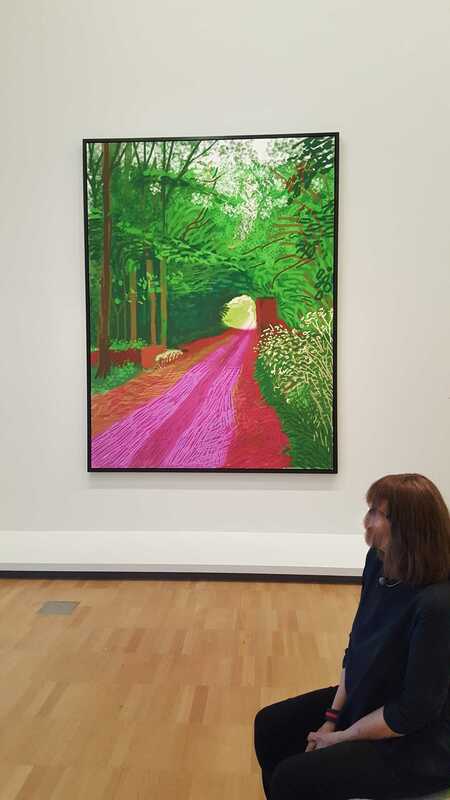 Despite Hockney’s years, he still looks for new ways to take risks which are driven by his unending curiosity (NGV 2016). Viewing this exhibition proved to be a wonderful experience which I enjoyed very much, and was grateful for being given the opportunity to view. 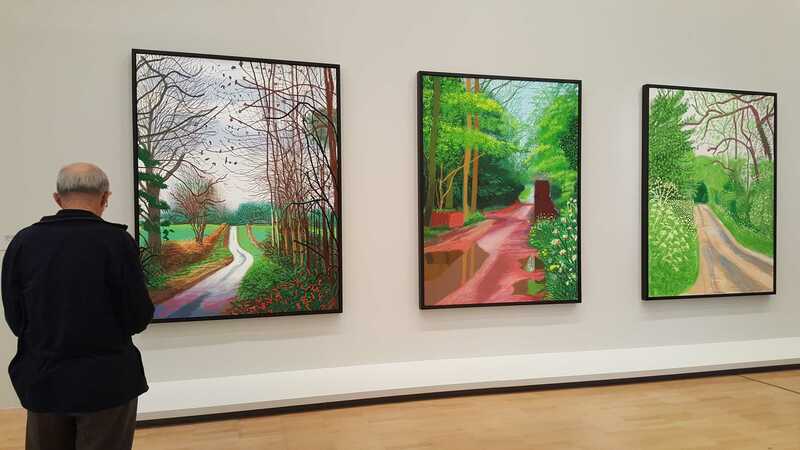 The exhibition consisted of over 1200 works including paintings, digital drawings, photography and video works by David Hockney. 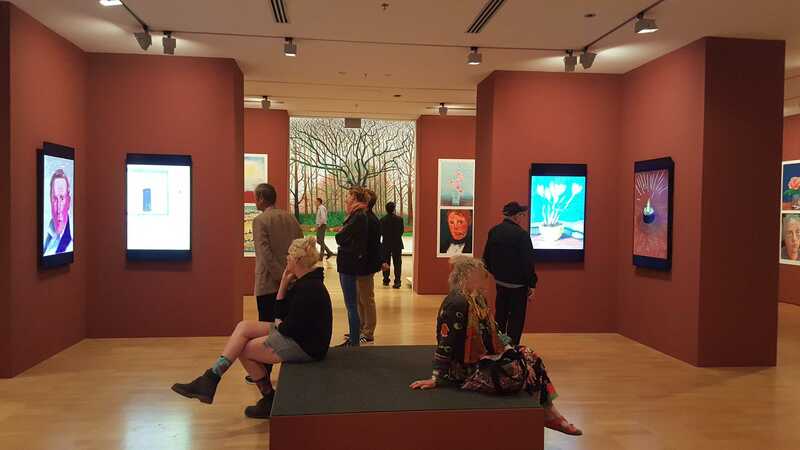 The YouTube here below has David Hockey talking about this exhibition at the National Gallery of Victoria being the first show that really exhibits the iPads and the iPhones work he had created. 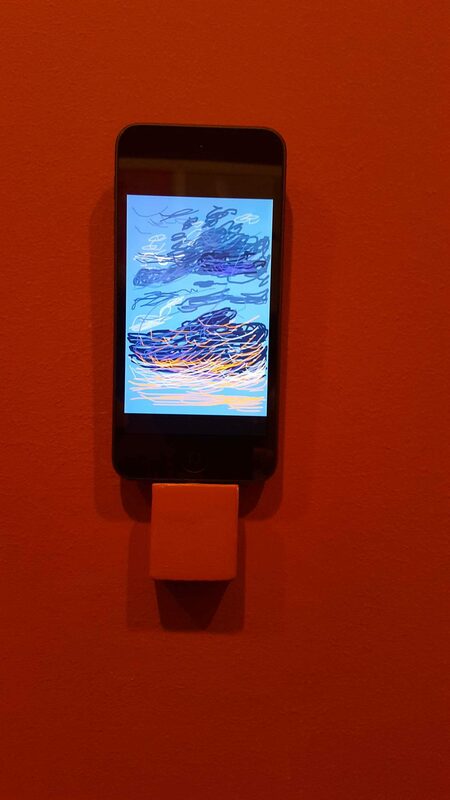 He states that he got the ‘brushes app’ process working quickly and well; and how much he enjoys using these new pieces of technology to produce art work. He also talks about his creative processes used to produce this exhibition (NGV 2016). 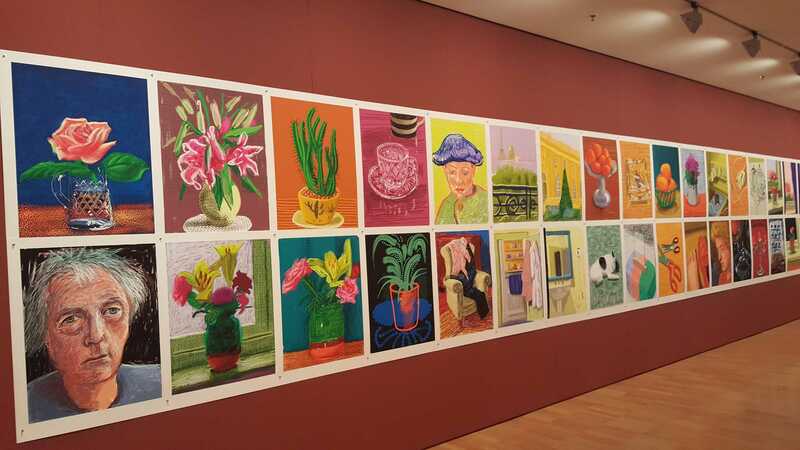 Viewing David Hockney’s ‘selection of 104 drawings using an iPhone 2009 and iPad 2010-12, comprising still life, landscape and portrait works’ (NGV 2016) was truly amazing, and for me – very enjoyable. 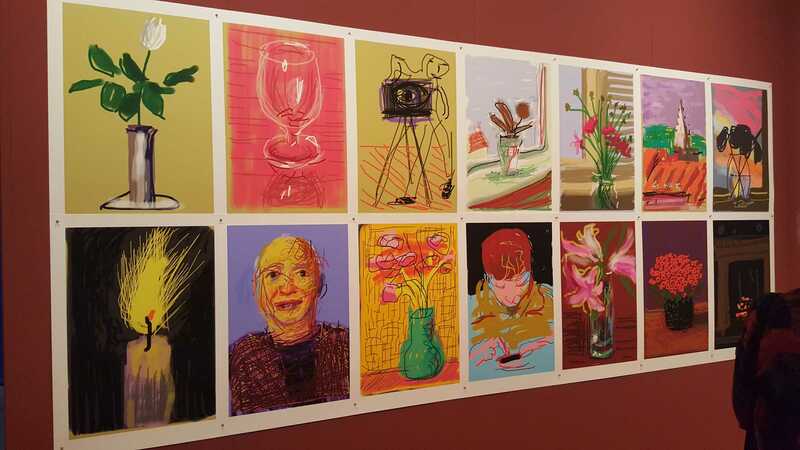 I loved seeing how these technologies produced a selection of work that was considered most worthy of such a prestigious exhibition; and by such a famous, well established and masterful artist. So good for up-and-coming tech savvy artists! 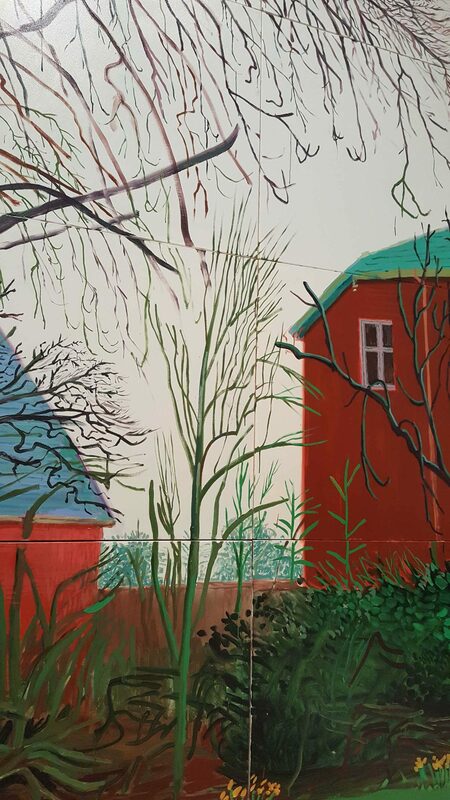 David Hockney within the YouTube below (uploaded on Mar 11, 2011) – gives a small demonstration using an iPad to create a digital drawing. He talks about how ‘the old will give way to the new’ being new technologies such as the iPad which offers easy processes to do editing and distributing of work by the user. 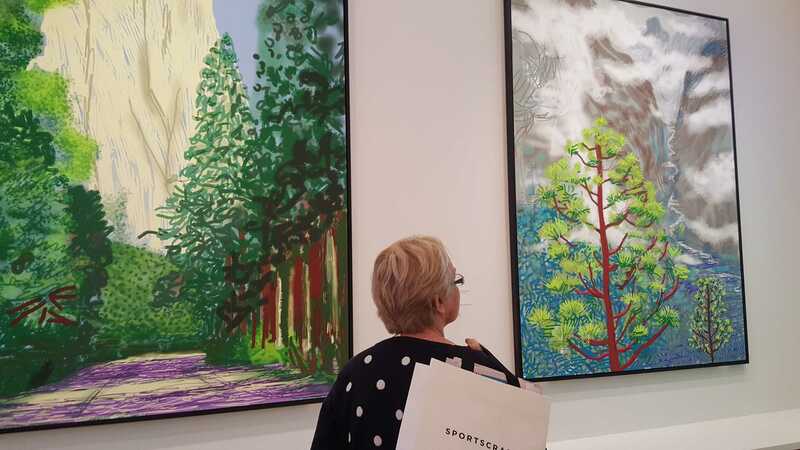 David Hockney here within this YouTube below – talks about his experience photographing and painting the Grand Canyon, about the extensive processes he undertook to be able achieve the result he wanted. 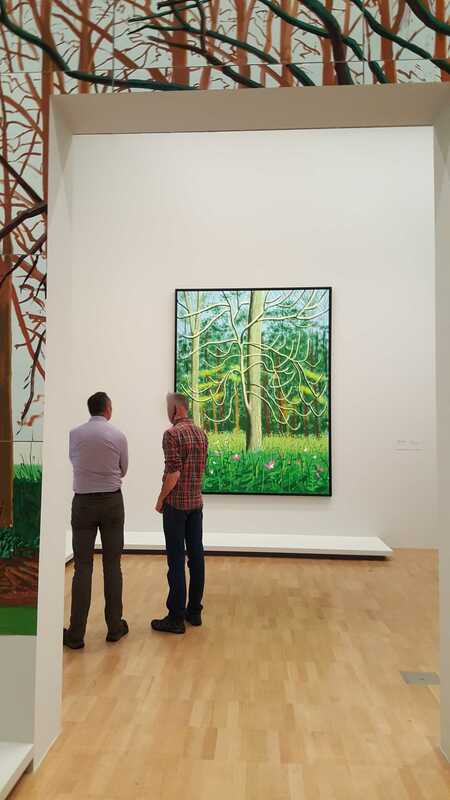 David Hockney’s massive oil painting titled ‘Bigger trees near Warter’ (as featured in the series of photographs below) within this particular exhibition, is awe inspiring. The spacial feeling you get when you walk in the room it inhabits, is surprising. 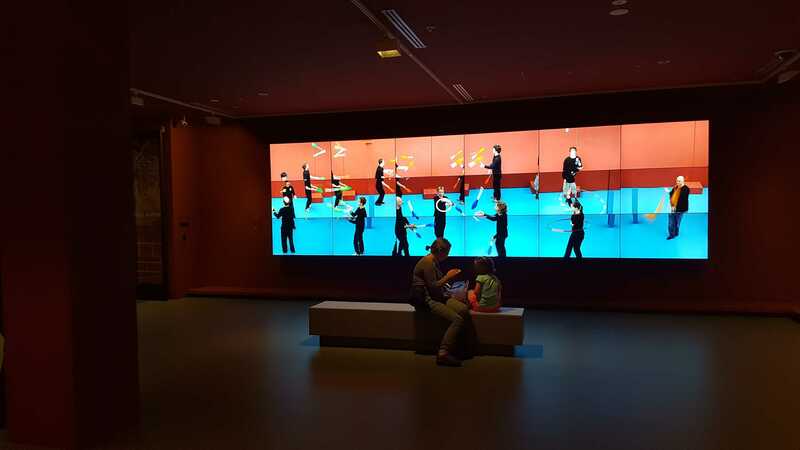 Cleverly – it has the viewer needing to scan the room to appreciate the whole work. 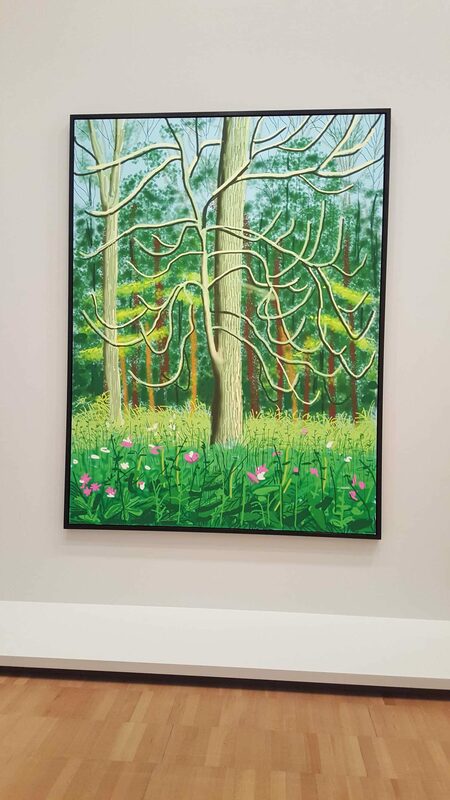 David Hockney talks about this spacial awareness in the YouTube above (NGV 2016). 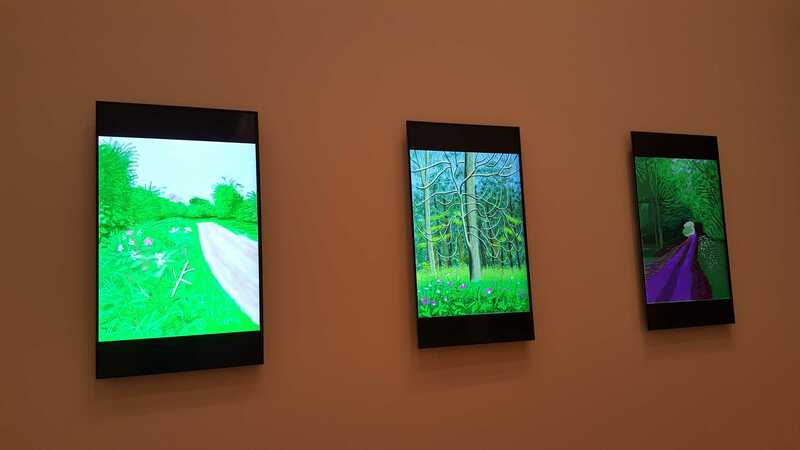 Below are photo images of David Hockney’s iPad drawings which is part of ‘a complete suite of drawings created by Hockney in Woldgate, East Yorkshire, UK, during the change of season 2011 and in Yosemite National Park, California, USA, 2011’ (NGV 2016). 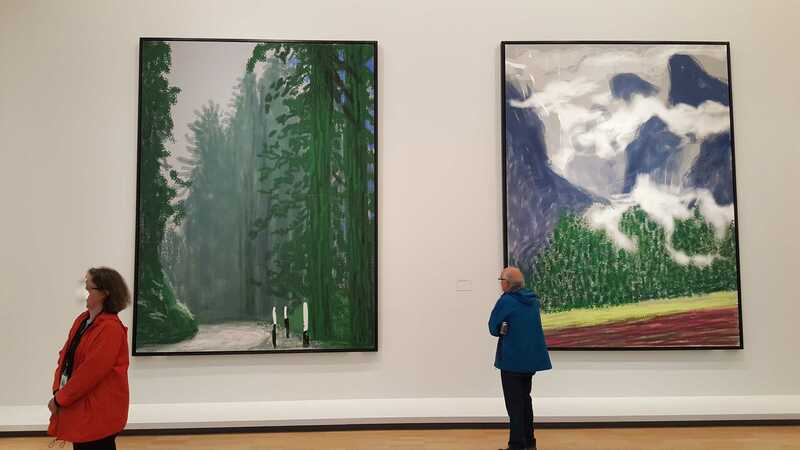 David Hockney talks here below about using digital photography, about manipulation of said, about the opportunities to recreate images, and about being able deliver to the viewer a different way of looking at his works (Published on May 14, 2015 – Channel 3 News). 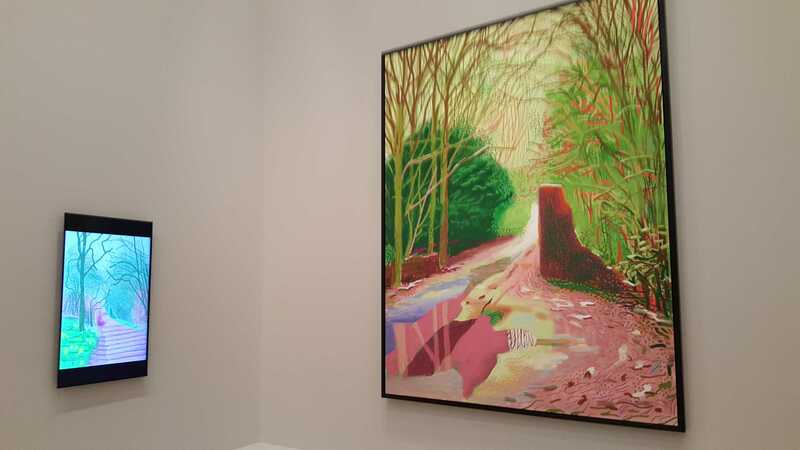 Hockney talks about still being very excited about pictures! 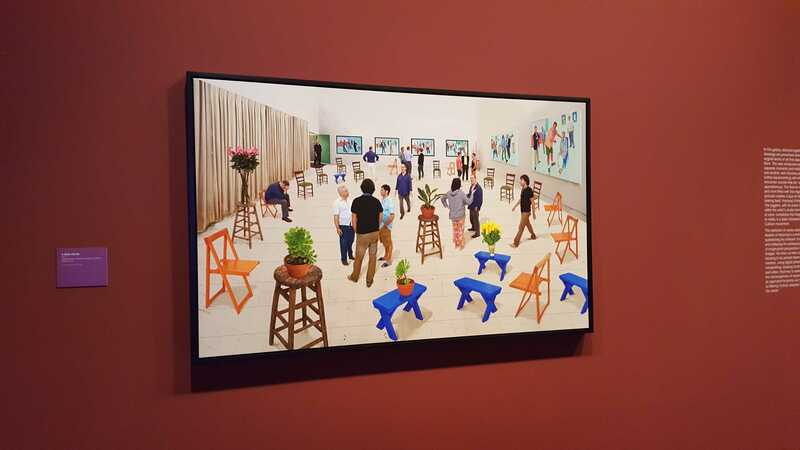 Below features one of a selection of David Hockney’s works ‘4 blue stools 2014’ using ‘multiple high-definition video cameras and still photography with digital compositing, to create new scenes with multiple perspectives and vanishing points 2011-15’ (NGV 2016). Once again, the spacial feeling you get when you walk in the room it inhabits, is surprising. 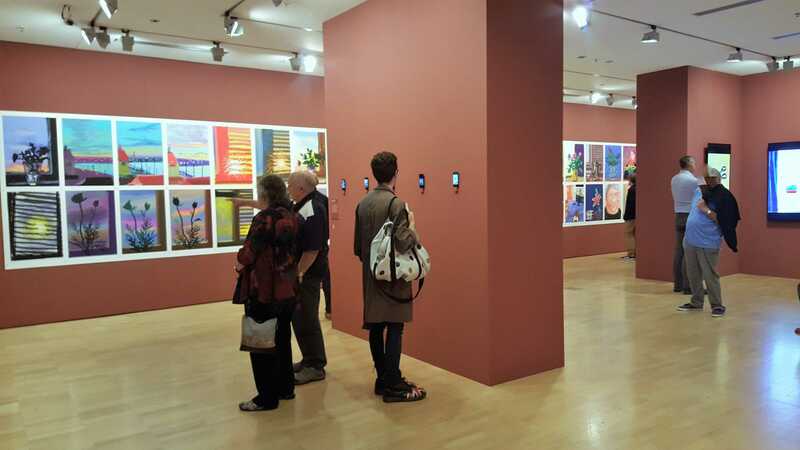 Cleverly – it has the viewer needing to scan the room to appreciate the whole work. 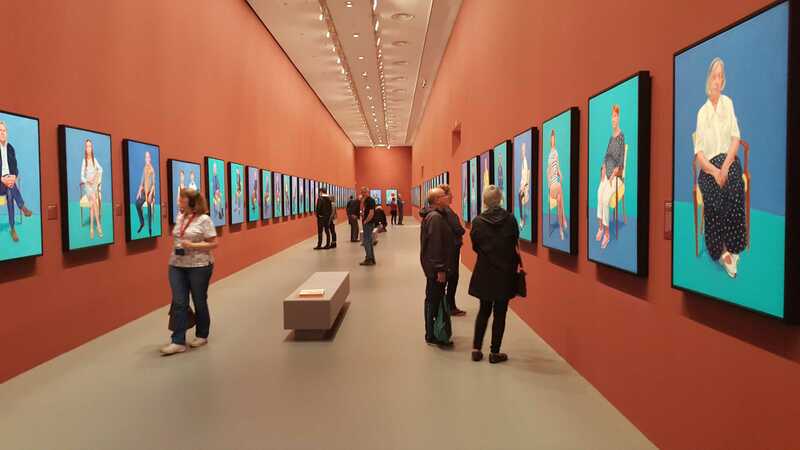 David Hockney talks about this spacial awareness in the YouTube above titled ‘I Am a Space Freak” (NGV 2016). 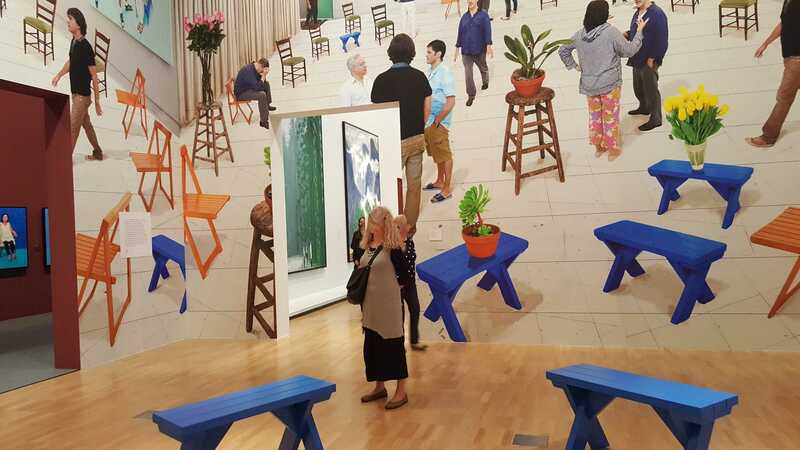 Below features another one of a selection of David Hockney’s works using ‘multiple high-definition video cameras and still photography with digital compositing, to create new scenes with multiple perspectives and vanishing points 2011-15’ (NGV 2016). 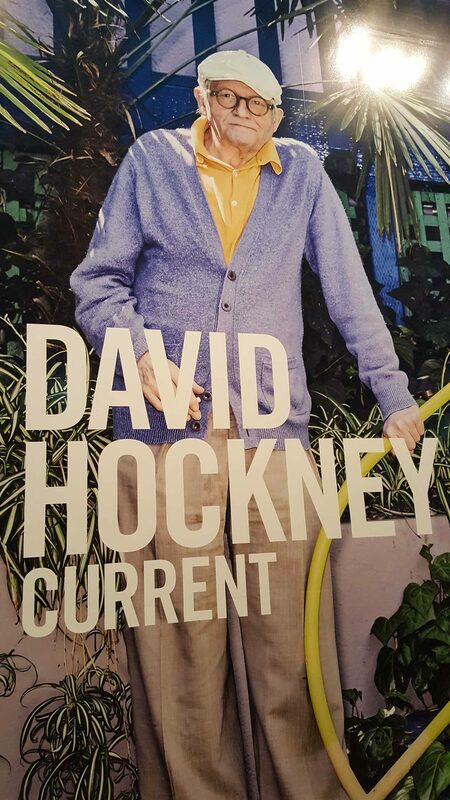 David Hockney’s Exhibition ‘CURRENT’ also features a ‘complete series of 82 portraits and 1 still life, a body of acrylic on canvas paintings 2013-16’ (NGV 2016). 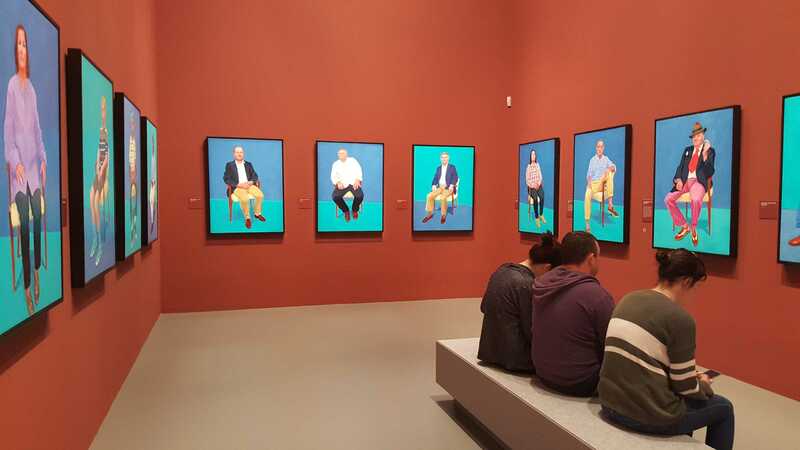 These portraits have all been painted by David Hockney and depict those connected in some way with Hockney’s daily life (NGV 2016). 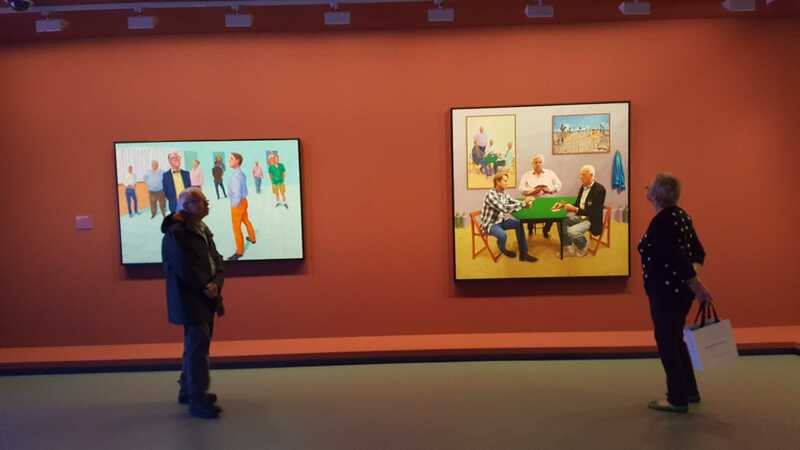 Upon entering the area of the exhibition housing these portraits, you cannot help but think about the spans of work he has achieve in such a small amount of time being between 2013 and 2016 – where does he get the energy? 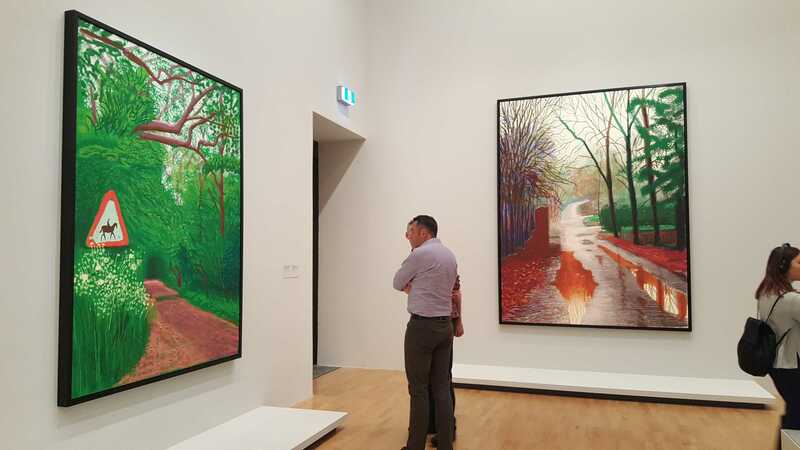 An amazing exhibition, an amazing living artist and an extraordinary life of a man who has devoted much of his life to his passion, the creation and production of his art work – David Hockney. I loved it! 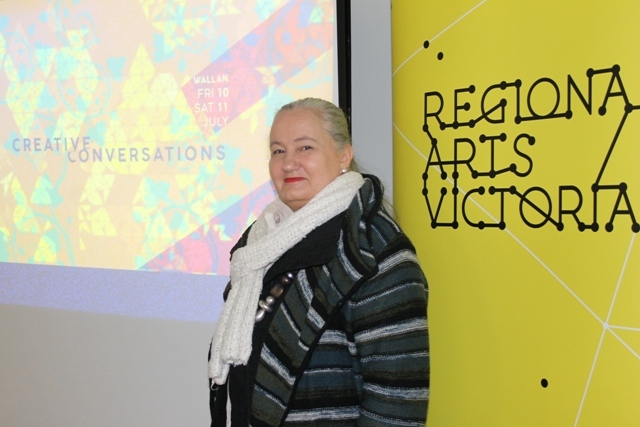 On Friday 10th and Saturday 11th July 2015, Regional Arts Victoria brought together artists, cultural and community groups, and services providers together in an event titled “Creative Conversations“. 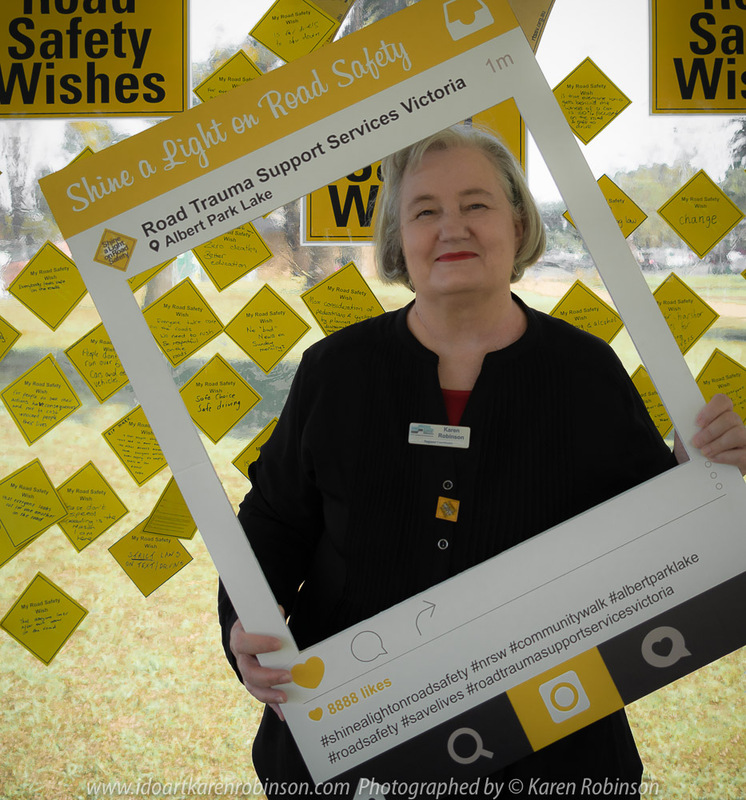 It was held within a regional township called Wallan, Victoria – Australia and at their local multipurpose centre. The purpose of this event was to have all parties share their understanding and experiences, in relation to creative practices, that are helpful within communities recovering from the impact of natural disasters. It covered how art and art therapists, can assist in the development of “Post-Traumatic Growth” through specifically considered programs and approaches, that can positively help trauma affected individuals, groups and communities. Greater insights into “Post-Traumatic Growth” gave the audience a clearer understanding about how “art for therapy” can be transformative; how it can improve an individual’s and/or a community’s sense of wellbeing after a traumatic experience. I was fortunately able to attend all of the first day’s and most of the second day’s events. Below outlines the structure of the days’ events which is inclusive of the name of each speaker and the subject matter they covered during their presentation (RAV 2015). Also I have included some lovely photos I was able to take over the two days! Creative Recovery and the Creative Recovery Network: An introduction to a growing network of artists and cultural and community workers taking the lead in helping their communities recover from the impact of natural disasters through creativity. Greg Ireton, Disaster Recovery Advisor & Chair, Creative Recovery Network. Panel Discussion: An opportunity for attendees to ask questions on creativity, community and recovery with the speakers. Welcome and Introduction to Day 2! WHAT DID I GET OUT OF THIS EVENT – CREATIVE CONVERSATIONS? I found myself realising even more, that “my own art for therapy journey” was/is very much alike what others have experienced after being subjected to a traumatic event. After listening to the speakers it was clear that the path I have travelled has been and still is what was coined as “Post-Traumatic Growth“. It also became apparent to me that people and whole communities fare much better where appropriate care and support is offered by trained professionals within the field of ‘Post-Trauma Growth’, along side of their personal ‘art for therapy’ endeavours. 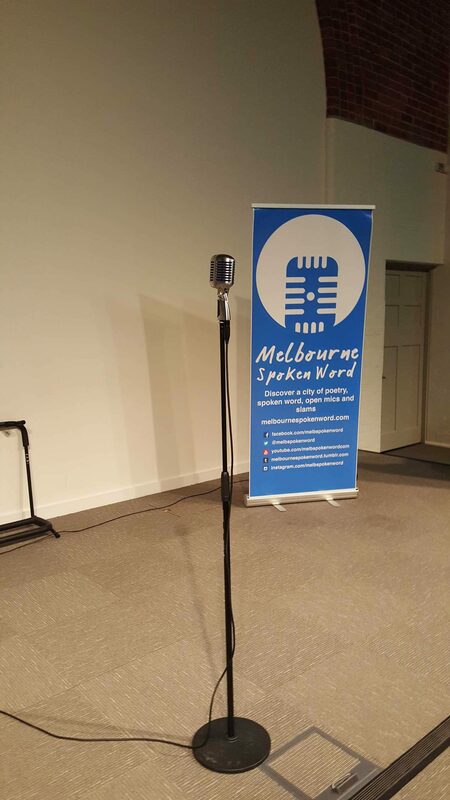 During the event breaks, I found myself talking and listening to other attendees, mostly listening as they shared their personal stories about loss, grief, despair and ‘Post-Traumatic Growth‘. Some of the stories I heard were deeply personal and some people were still struggling to reach a place where joy could be found in every day, even after many years since the traumatic event. They talked about how they use art forms such as crocheting, painting, singing, dancing, writing etc to help manage their daily struggles in obtaining a good sense of wellbeing. I came away better appreciating how the combination of “art for therapy” in conjunction with specialised professional care and support in the field of ‘Post-Traumatic Growth‘, can help people find a new path forward. It was clear after speaking and listening to others at this event that this path of ‘post-trauma growth’ can be short for some, long for others and sadly for a few – never-ending. 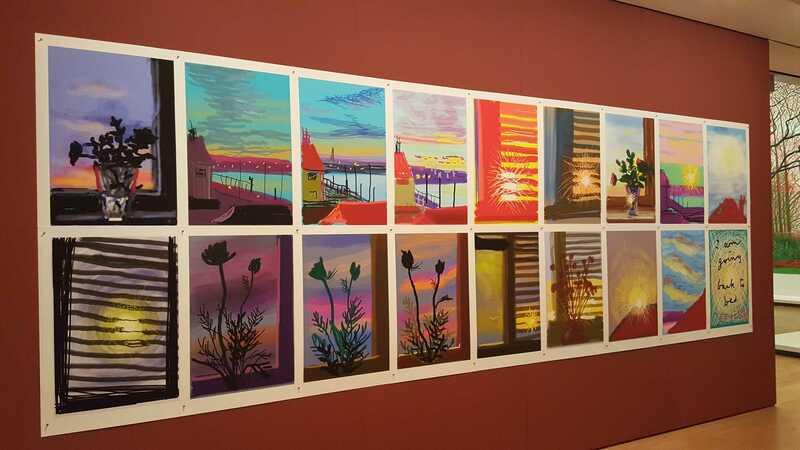 At the end of the first day of this event, a celebration with all occurred, which marked the opening of the Mitchell Makers Exhibition of new contemporary art from the Mitchell Shire, Regional Victoria, Australia. Please find below a slide show of art works that where on display at this event. Nexus Primary Health in partnership with Regional Arts Victoria, Mitchell Shire Council, MCRAG and the City of Whittlesea on the 16th September published this interesting “heartwarming grassroots documentary which highlights the powerful effect of how creativity & community spirit can be harnessed to achieve healing, transformation & recovery from trauma, natural disaster & all things that knock us sideways” (Nexus Primary Health 2015). 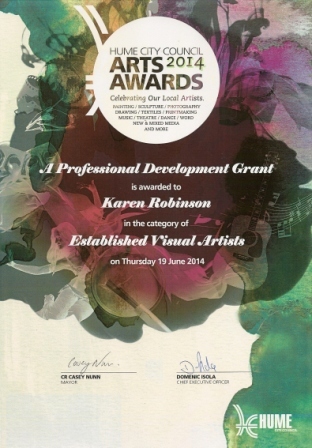 It’s a big role that Regional Arts Victoria (RAV) plays across the state of Victoria, Australia which assists, in keeping the arts alive, within these communities; and helps community members rebuild lives and townships after devastating bush fires have swept through their homes, their lands and their lives. 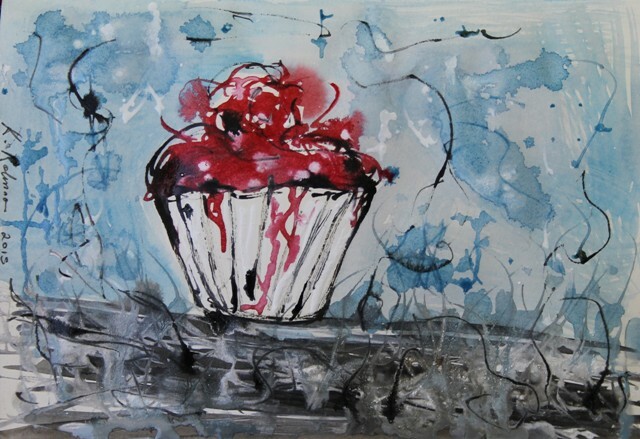 This particular event “Creative Conversations” was a wonderful way of bringing together a diverse group of people such as stakeholders, communities and individuals to share, learn and think about the wellbeing of people who need help with their “Post-Traumatic Growth” journey – Art for therapy at its very best I feel…. My Art Therapy Group Sessions have now come to an end. Part of me was sadden by this, as I was going to miss the meeting up each week, with a group of women whom I have gotten to know and appreciate. Over a period of seven weeks, we have all shared deeply personal thoughts, emotions and feelings with an honesty and frankness that is generally very rare with people whom you barely know. 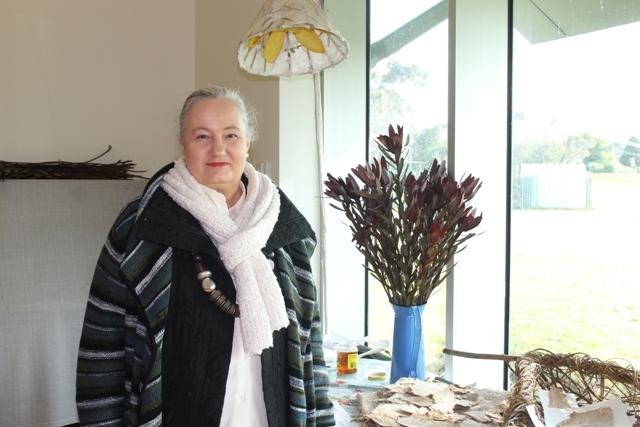 The art therapist herself proved to be an intrinsic part of the success of this Art Therapy Group set of workshops. We left with the knowledge that art for therapy, has a place in our lives that will give us a voice to express ourselves seriously and sometimes just for the fun of it! It was at this last Art Therapy Session, the Art Therapist had us start with an exercise that would involve each of us contributing to one another’s art work. We were asked to gather up, art materials and a piece of butcher paper and commence producing an art work. The theme was around, what we found we had gained from attending the Art Therapy Sessions overall; and what we had gained also from each other. We were given a short period of time to do this and then we were required to passed onto the group member next to us to contribute their part. This process preceded via each group member until each had contributed on each and every art work. Featured above is mine and I commenced with a circle of green, squiggly lines and in the middle of that, I wrote the words ‘BEING’. Then I wrote the words: ‘exploring self’; ‘understanding others’; ‘appreciation’; ‘new connections’; and ‘new artistic ideas’. The rest of the art work were the contributions of the other group members. We were then asked to make a set of little cards that would be representative of each group member. Each card needed to be about what we had learned about that group member. 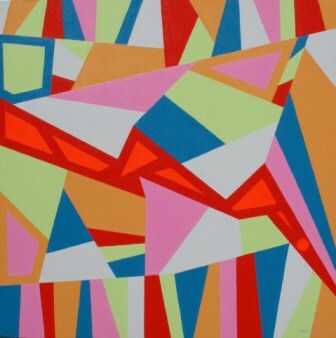 I firstly chose a colour that, for me, reflected their personality and then used symbols to tell my story as requested. I add a common element of the silver pieces which was a symbolic representation of finding the ‘silver lining’ in life. I also used gold and silver paint to be symbolic of the best I found in them all over the course of the 7 sessions. Once this task was completed, we shared with each other our cards and their stories about that group member. NB: Below are my set of cards – each representing a group member and the bright green card is the one I made for myself. This week’s Art Therapy Group Session revolved around selecting one to two cards, from a set of cards called ‘Healing with the Angels Oracle Cards’ by Doreen Virtue Ph.D. The pack consists of 44 oracle cards with unique Victorian-style or Old Master-style angel pictures on one side. They convey a simple statement on the front side of the card and on the reverse is the full meaning of the ‘angel readings’. During this session, these cards were used just as a means to creating another meaningful piece of art within this art therapy session. After we had all thoughtfully considered which ‘Angel Card/s’ and it’s statement had appealed to us most, we were asked to collect them and assemble as a group at the table. The Art Therapist asked each of us to explain our reasons for selecting our specific cards. 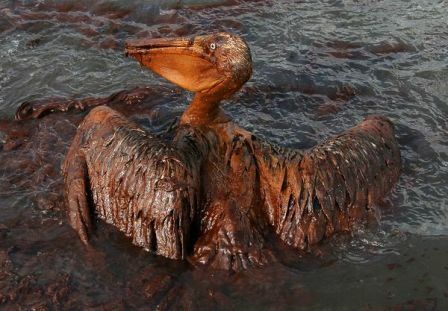 When it came to myself to explain, I suddenly found myself very emotional and began to cry. It was a shock to me and I didn’t think I would be able to continue but with a breath of time, I was alright to do so. My choice of the ‘Blessings Card’ was related to the fact that after my son had been killed in a single vehicle crash, I found it very hard to find joy and meaning in my life. 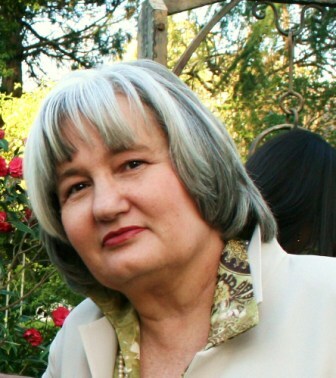 It took so much inner strength to look at my life in a different way and it was very hard to look forward without my son but I worked hard at looking at what blessings I had, which eventually lead me to a better place in my life. The second card for me ‘Ideas & Inspirations‘ was all about finding that new path, rebuilding myself and finding joy in everyday life – it took a lot of ideas and inspirations to do – but I am there and grateful to be able to enjoy life again. Once we had all talked about our reasons for choosing our particular cards, we then received instructions about our next art therapy project. We were to make little ‘candle holder covers’ from assorted provided materials. These covers once completed were then stuck to the outside of a glass jar and a little tea candle placed within it and lite. I decided to base my glass candle cover around people; people in my life. Here below you can see how I have strung them together and when placed around the glass jar, they complete a full circle. Different colours represent different types of people, and the different heights represent the different ages of these people. 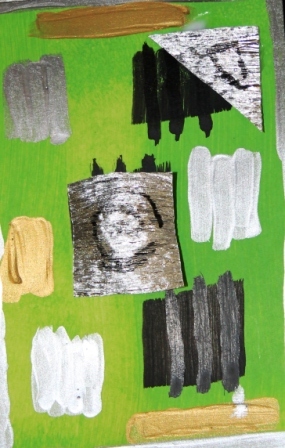 The image below I particular like as it shows one large purple person looking down at the small yellow person in a caring way – the green person is part of this group and at the same time is reaching, stretching out to connect with another within the circle of people. This week’s Art Therapy Group Session consisted of a well attended group of 5, plus the Art Therapist and the assisting facilitator. We commenced our session with a light physical stretching set of exercises for approximately 10 minutes. Just to get us loosened up. We were then asked to sit down and close our eyes and concentrate on our breathing, clearing our minds of other thoughts, relaxing our body and bringing ourselves right into the present. From here we were asked to think of a space we felt safe in; it could be a real space or it could be an imaginary space. We were asked to image ourselves walking through this ‘safe space’ and to think about what it was that made us feel safe. It was a very relaxing process where I could feel my mind and body totally washing away other thoughts and emotions and truly being in the moment. After completing our paintings, we were asked to place them in a line across the floor. Each of us in turn talked about what our painting said in relation to painting about our ‘safe space’. It was interesting to see and hear what others had painted and said about their ‘safe space’. A number of the group had ‘imagery safe spaces’ and others had ‘real safe spaces’. 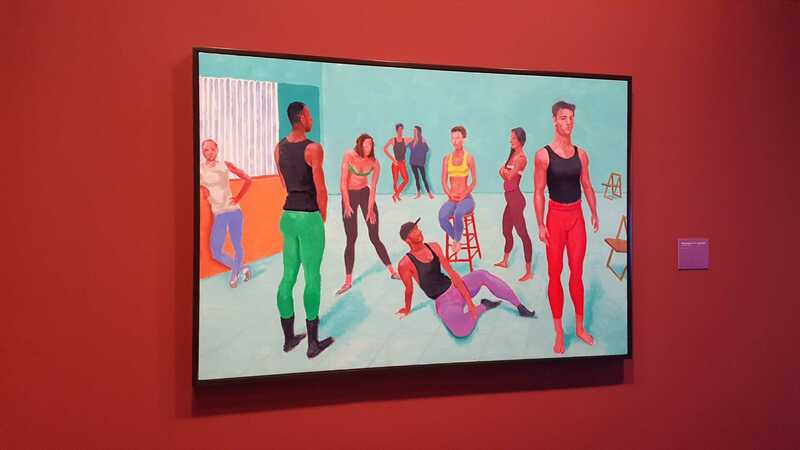 My painting was based on a ‘real safe space’. It was my home garden which my husband has worked on for over 13 years to create from bare soil. Every room in our home has a view of our garden. The garden its self is full of well established bushes and trees where wild life flock to rest, feed, drink water and go about the daily lives. Over the seasons, the leaves on the trees go golden brown, yellow, orange and drop; in spring they flower and in summer they provide us with must needed shade to protect us from the strong Australian sun. In my painting about my ‘safe space’ the golden-yellow represents the soft warmth of the sun in spring, when it warms my cheers and reminds me of the summer to come. The blues remind me of our beautiful clear bright blue sky, we as so fortunate to have here in Australia. The planting represents a plant my husband has used to line each side of our garden leading from the road to our front door. So with a small sheet of butcher paper, acrylic paints and a charcoal stick, off I went! My art piece was inspired by the rhythm and joyfulness of the music and how it made me feel. I decided to use a small roller to apply the paint to the surface as I had never used a roller before and really enjoy the freedom it gave me to push around the paint; in motion with the music. The colours I chose were favourites of mine; brilliant orange, bright sky blue, metallic gold, silver and then black for some definition. Then I took to using the charcoal stick to edge some of the rolled lines; it was another art item that I had never used before. It was easy to emerse myself into the music and the art – gave me a great sense of being in another world, a world without any other thoughts, emotions other than what was at hand – the music and the art. This process, I found very calming and enjoyable; most of the other group members seemed to have enjoyed the experience as well. After finishing off our individual art works, we layed then on the floor in front of us. Each one of us in turn, talked about our painting results; what it meant to us and how did the music impact us during this process. It was interesting to note that all members of the group had mostly happy stories to recall and it was clear that this particular ‘Art Therapy Session – using music to inspire the artist within’ was a joyful experience and perhaps unlike some of the others where deeply personal and sometimes sad emotions had surfaced during a session. We were then asked to participate in a group effort to produce one single piece of art work. 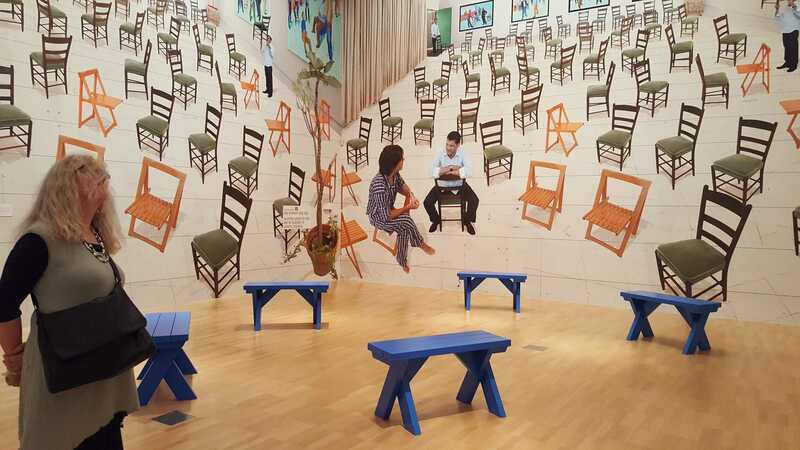 The art therapist layed out a single stretch of butcher paper along a number of tables so that we could all have the opportunity to walk around the entire circumference of it. Without words and with the beautiful music playing in the background, we went about creating a group painting. 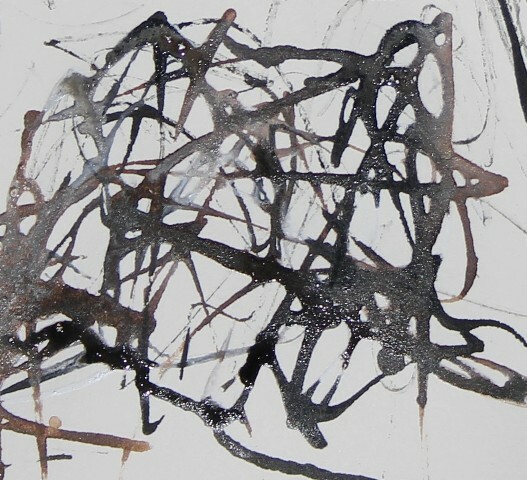 Quietly and studiously, each of use went about creating our part of the painting. At the end of the time frame given to complete our group effort, we were asked to share what we experienced throughout the process. For me, I found it more fun than what I thought it would be! Whilst at first, I was a little apprehensive to paint over another’s efforts, I found it liberating once I had decided to let go and just do! I didn’t think that I would enjoy this process because, it would mean it would require of me to share with others an art expression; but it was strangely liberating and fun. An important part of my art therapy process has been taking photos of people and places that I am most interested in. Looking through a camera lens and concentrating on framing up a story in the camera view finder, totally absorbs ones concentration. Spending the time reviewing them and deciding which will be a candidate for an abstract painting, also adds to the therapeutic process. 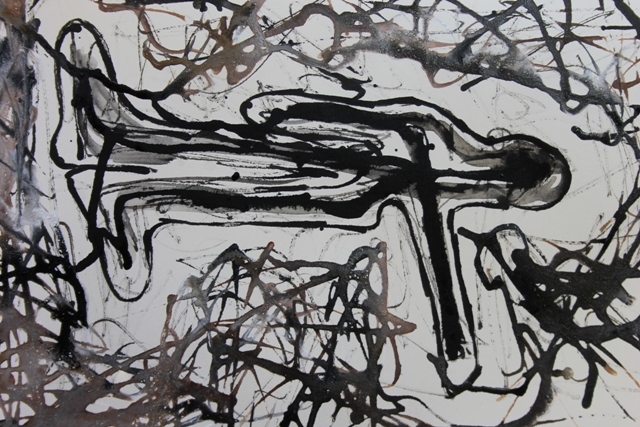 I use photography as my visual diary for my abstract painting art work. Melbourne Cup 2008 at Flemington Racecourse – Photo taken by Karen Robinson – Abstract Artist NB: All images are protected by copyright laws! 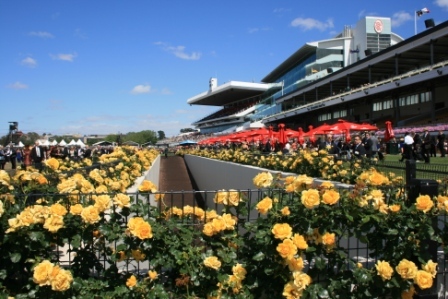 On the first Tuesday November 2008, I said to my husband, let’s go to the Melbourne Cup at Flemington Races – as I wanted to take a series of photos of this iconic Australian event. 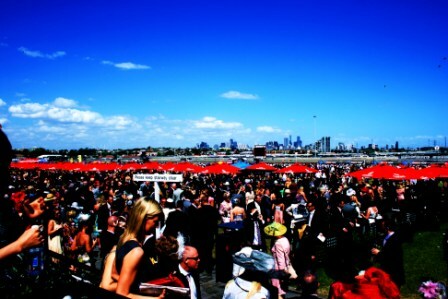 A number of days before hand, we had attended Derby Day at Flemington Races where I had taken a series of photos. 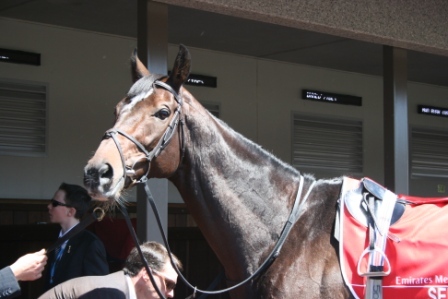 I wanted to also capture photo images of the Melbourne Cup Day as well. These photos were used as a source of inspiration for four abstract paintings (Nos. 32, 33, 34 & 35). I have always loved fashion and the Melbourne Cup and for these reasons, it is certainly a stand out on Melbourne’s social calendar for socialites, politicians, Australia’s rich and famous; and the everyday Australian punter! The very first Melbourne Cup ran in 1875; a century and a half later it is still considered ‘the race that stops a nation’. 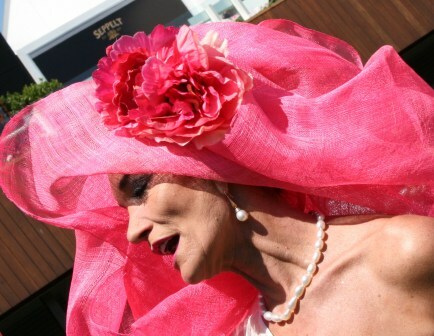 For me this significant event is all about the horses and the fashion and on this day I took many photos of fabulously dressed women in their racing finery. Melbourne Cup 2008 at Flemington Racecourse Photo taken by Karen Robinson – Abstract Artist NB: All images are protected by copyright laws! My husband joined me to keep me company on this particular day. 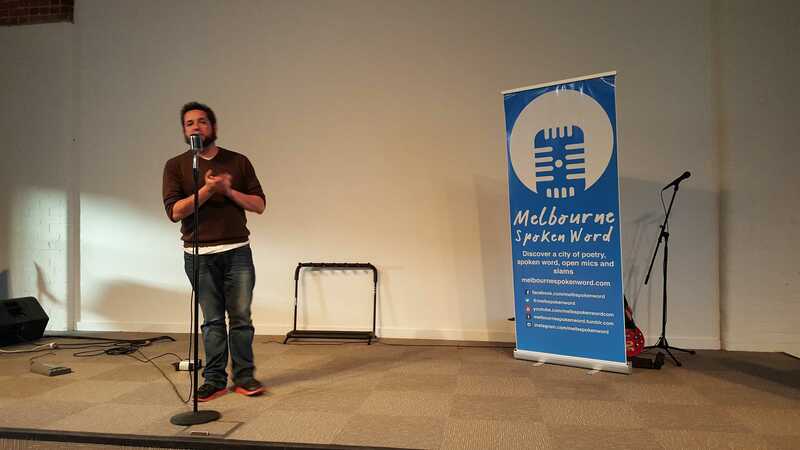 It was a beautiful day and once again Melbourne had turned on a great Australian Event! 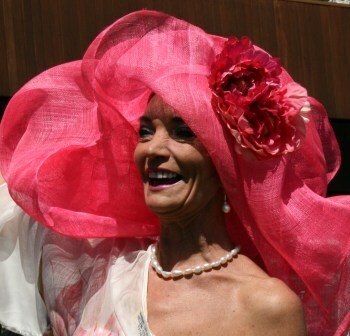 Melbourne Cup 2008 – Helen Court – Lady in Fabulous Pink Hat Photo taken by Karen Robinson – Abstract Artist NB: All images are protected by copyright laws! These photos I took served as an inspiration for me and I painted this portrait of Helen Court. 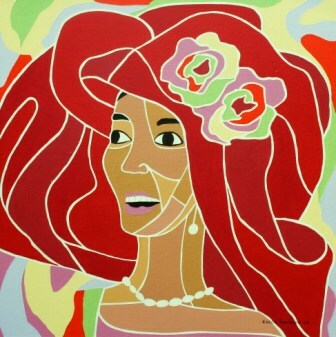 This portrait was one of four abstract paintings (Nos. 32, 33, 34 & 35) I did of different race goers during the 2008 Melbourne Racing Season. During the process of sorting my photos, I also like to take the opportunity to be more creative and change their appearance by digital manipulation. For me they then become an Abstract Digital Photo Painting. This process totally engages the thinking processes and is a great pathway into using ‘art for therapy’.